Algae Perhaps you have encountered laver seaweed wrapped around your favourite sushi roll, but the first group may catch you by surprise if you aren’t familiar with cuisines that have traditionally cooked with algae, which range from Japanese to Welsh. These sea growing plants are critical for oxygen production and are rich in essential fatty acids, phytochemicals/antioxidants, and savoury umami flavour. Try topping your next salad with lightly fried wakame seaweed for a salty crunch. 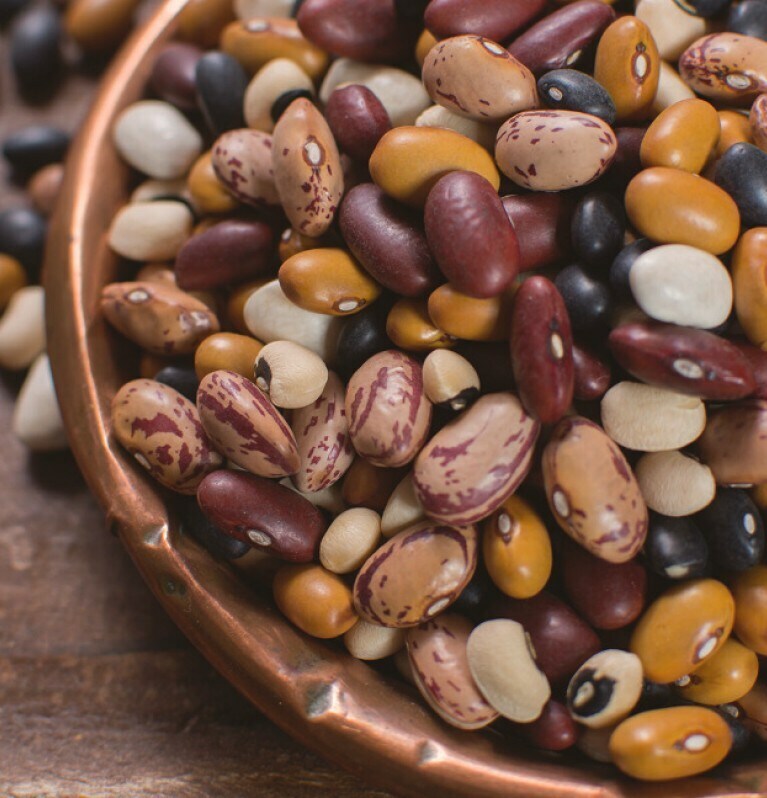 Beans & Pulses These members of the legume family are a smart choice for farmers because they convert nitrogen in a way that helps other crops grow. They are a smart choice for eaters because they are nutritious and delicious! Try swapping black turtle beans for ground beef in a stew or add lentils to your next burger mix for a protein packed sandwich with lots of fibre and flavour. Cacti More than just cute home décor, the cactus has long been featured in Mexican cuisine. Nopales, or prickly pears, are drought resistant and full of vitamins, fibre, amino acids, and antioxidants. Use them to add fresh flavor to salads, smoothies, and more! Try adding nopales to your favorite salsa recipe. Cereals & Grains Grains are staple foods across the globe, but our global reliance on rice and wheat limits the nutrients we get with our carbohydrates and restricts food systems in a way that can be detrimental to the environment. Treat yourself to something new, like spelt or finger millet, both mineral-rich ancient grains with a nutty flavour that can take the place of rice. Wild rice, which is actually a seed, can be popped on the stove for a nutritious version of popcorn. Fruit Vegetables You’ve been told to eat your fruits and vegetables, but what about your fruit vegetables? These are fruits that are generally mistaken for vegetables. Tomato is a familiar one, but try an orange tomato for a slightly sweeter flavor and up to twice as much vitamin A. Trying pairing them with okra, another fruit vegetable. Season and sauteé okra and orange tomatoes in olive oil for a delicious side dish. Leafy Greens Talk about a nutritional powerhouse! Leafy greens deliver fibre, vitamins, minerals, and a plethora of health benefits. Some, like spinach and kale, are already popular in salads and soups. Up your intake of those and keep the leafy green party going with mild, crunchy pak-choi or antioxidant-rich, peppery tasting watercress, or colorful red cabbage. Go to the Cooking tips section at Knorr.com for the Future 50 Foods cooking tips that can help you add, swap and create new recipes with the Future 50 Foods. Mushrooms It’s not a party without a fungi! Add meaty texture and savoury taste to stews, pastas, stir-fries, and sauces with an earthy tasting maitake or nutty, rich saffron milk cap mushroom. Savor the flavor and reap the nutritional benefits of vitamins, protein, and fibre. Nuts & Seeds Time to get nutty! While nuts and seeds feature throughout world cuisine, there are several underutilized varieties that can offer many nutritional, environmental, and flavourful benefits. Get your hands on hemp seeds, which can be added to sauces, salads, or baked goods, for a boost of protein, fibre, and good fats (omegas). Sesame seeds, another Future 50 seed, can be toasted and added to any side dish for a fragrant crunch. Root Vegetables Great things happen underground! Root veggies grow deep in the earth and emerge hardy and nutritious for us to enjoy at a time when warmer weather crops are unavailable. Black salsify is one lesser-known example, and it offers vitamin E, iron, and a sweet, parsnip-like flavor. Try it as a roasted as a side dish, or mashed in place of potato. Tubers Tubers are a valuable source of energy, but another category in which we do not take advantage of the huge variety available. Swap your usual sweet potato with ube, or purple yam, for a burst of color and a boost of vitamin E. Look for lotus root to add a tangy crunch to your next stir-fry. The chefs at Knorr want to help everyone enjoy more of The Future 50 Foods for healthier people and a healthier planet. Get inspired to cook with with a new ingredient today! See our recipe section Click here for delicious recipes that make a difference.